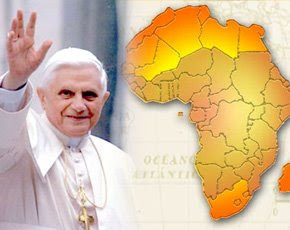 A group of Nigerian bishops expressed hope that Pope Benedict XVI's first visit to Africa will spur the troubled continent on a path toward peace, justice and reconciliation. Three bishops from Nigeria said they are looking at Pope Benedict's March 17-23 visit to Cameroon and Angola as an opportunity to show that the church wants to help heal divisions that continue to tear apart the continent. During his trip, the pope is set to present the working document for the October Synod of Bishops for Africa, which will be dedicated to finding ways Africa can overcome lingering conflicts and seek reconciliation, justice and peace. Bishops from Nigeria were at the Vatican Feb. 5-28 for their "ad limina" visits to report on the status of their dioceses. The visits gave Pope Benedict the chance to get a firsthand account about the situation on the ground. Nigerian Bishop Michael Odogwu Elue of Issele-Uku said that the problems of ethnic conflict, poverty, corrupt political leaders and religious intolerance would give synod participants "enough work for a lifetime." Bishop Anthony Okonkwo Gbuji, the retired bishop of Enugu, said, "We don't need to look very far to see problems and know reconciliation is needed." He said the bishops see the pope's upcoming trip "as an opportunity for us to really emphasize that reconciliation is serious for the church." "The head of Christendom is coming to bring that message powerfully to the people who need reconciliation, peace and love," he said. Bishop Elue, whose diocese is in the southern Niger Delta region, said the problem of kidnapping people for ransom has become more widespread. While foreign oil workers continue to be abducted as a method of intimidation or extracting ransom money, criminals are now seizing local Nigerians as a way to raise cash, he said. Seeking ransom has become a very lucrative business, he said, and appears to be more prevalent today than armed robbery. Once a person has been freed from abduction he or she still risks a repeated snatching because there is no one group that is coordinating the kidnappings, he said. "There doesn't seem to be any recognizable group that you can work with and talk to" in the hopes of guaranteeing one's future security, he said. People who are economically well-off or have a high political or social profile are more at risk, he said, and often they send their children to school abroad out of fear the youngsters will be abducted if they stayed in the area, said Bishop Elue. Bishop Gbuji, 77, said the Nigerian government has succeeded in preventing local conflicts and skirmishes from "exploding into a holocaust." He said Nigeria "became very wise after the Nigerian civil war" from1967 to 1970, which still "remains very fresh in our minds." The government created a federal police force and army that are dispatched immediately to quell an uprising before it gets out of hand, he said. "That way, no nation, particular state or tribe can rise against another without intervention from federal authorities," he said. Bishop Gbuji said many of the episodes of violence in Nigeria are triggered by "very minor things" because people have easy access to guns and will use them "to fight back in the face of little provocation." Usually, he said, it just takes "a third party to intervene and say, 'Stop. What are you doing? Don't you know life is precious?'" Once a conflict has been resolved, people easily "go back to business as usual as if nothing had happened," he said. While religious life is growing by leaps and bounds in Nigeria, Bishop Francis Ogbonna Okobo of Nsukka, 72, said he would like to see a more thorough teaching of church belief and a more careful administration of the sacraments, especially the sacraments of initiation. It is important "people know what they are doing, what they are getting into and what is expected of them; we can't baptize the whole world overnight," he said. He said if adults had a deeper understanding of their Christian faith, "there would be no crises between one religion and another" since people would be less likely "to regard it as their religion against our religion." "Christ never promised that those who are going to heaven are (only) those who are Christians or Roman Catholics," said Bishop Okobo. People who are not baptized members of a Christian community, but "who are, as it were, Christian in spirit, people who have love -- real Christian love" will be saved, he said.